It was never easy to create even a seamlessly, simple pattern using the old, outdated Adobe Illustrator, as it demanded the much required tricks and accuracy that were often hampered due to the repetition in the design. Earlier to take advantages of Illustrator’s not-so user friendly pattern features, either you had to be the pro of the pattern creation methodology, or you had to hire some design savvy to do the work for you. But, not anymore! 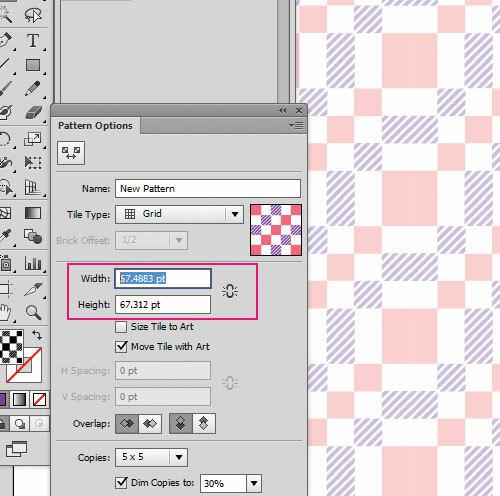 Fortunately, the new version of Adobe Illustrator CS6 has made creating seamless pattern a piece of cake. Now, it doesn’t matter whether or not you are a beginner, with these easy and accurate methods, you will have your own unique pattern on your desktop folder in no time. 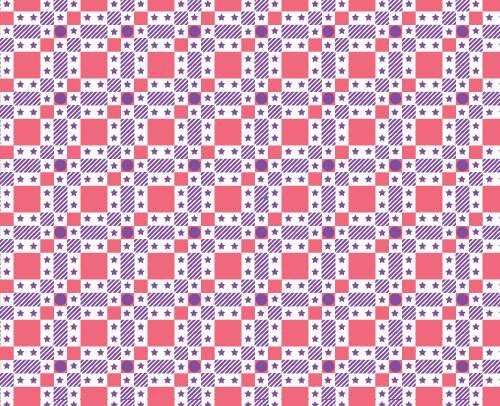 The following step-by-step process will show you how to easily and accurately create any seamless pattern without using any external source. Let’s take an in depth look at the updated Illustrator’s incredible features, and explore how it actually works! Whatever artwork that comes to your mind, ensure that you have the selected graphic saved on to your document folder. Nevertheless, you can always use your own creativity here to design another artwork that suits your taste. Now, to begin your pattern creating adventure, select the artwork and click on the Object menu. From Object menu, navigate to Pattern and then to the Make tab. 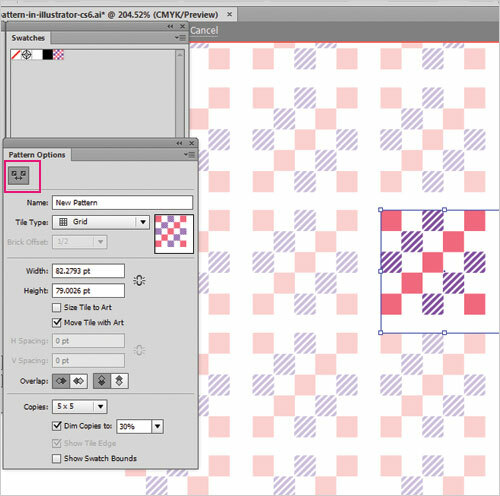 clicking on the Make option will switch your artwork into a Pattern Swatches mode. 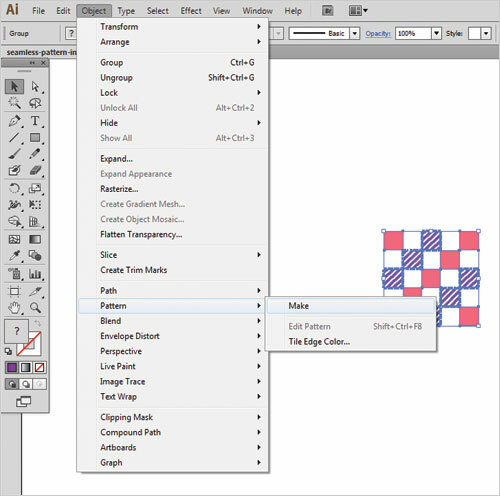 The Pattern Options Panel will allow you to take a visual control of the creation process, and will also help you edit the pattern along the way. Remember, that your artwork should be appearing in the swatches panel. The Tile Type Option at the top left of the panel will help you in creating and setting the size of the seamless pattern. Likewise, the Name field allows you to name or rename your pattern. Arranging patterns such as Grid, Brick by column, Hex by Column, Brick by Brick and Hex by Row is what Tile Type option allows you to do. How your pattern should be arranged and how the pattern preview should appear; all this changes could be easily adjusted using the Tile Type settings. Case in point, if you have select the Brick by Row and the Brick by Column for your pattern preview, it actives the Brick Offset, which lets you budge and change the tiles horizontally or vertically. Any alteration in the values set in the numeral fields of Width, the Height makes changes in the size of the pattern tile. The H and V spacing also arranges the spacing between two different elements of your pattern. To change and set up the size and location of the pattern tile manually, make use of the Pattern Tile Tool. To get back to the default shape of your pattern, however, you could check mark the Size Tile to Art. The aforementioned user-friendly features help you to edit your existing pattern swatches panel and develop new objects. 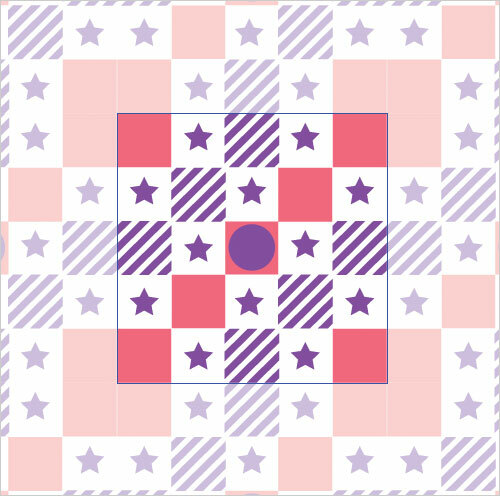 If you have welcomed any editing in your pattern size or spacing or preview, all applied changes will reflect on your newly saved seamless pattern. The Overlap Function allows you to introduce and add new objects to your existing artwork. When you change from the Left in Front mode to the Right in Front mode, the overlapping of your newly added elements of your pattern titles also changes. For the different ways of visual preview of your pattern, the elements available on the bottom left part of the panel will help out. Similarly, if you want to add number of objects’ copies in the seamless pattern mode, you should tick the Copies option. Moreover, for applying any change in the transparency of the created pattern’s copies, navigate to Dim Copies. Once, you are satisfied with how your seamless pattern looks, click on the done tab from the top bar to save your copy. 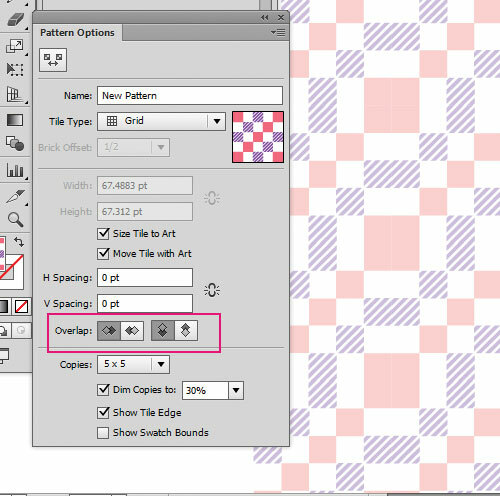 By doing so, you will automatically leave the Seamless Pattern creation mode. 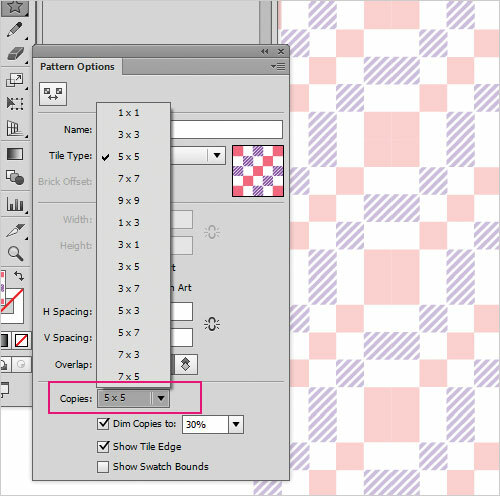 If you find any flaw in your created pattern, click twice on the pattern’s image from the Swatches panel to make necessary editing in your work. 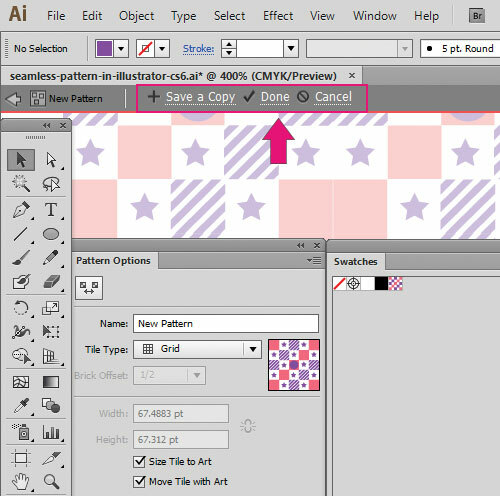 And, if you don’t want to edit the created pattern, then go the targeted location of your saved pattern folder to see how your seamless pattern looks. 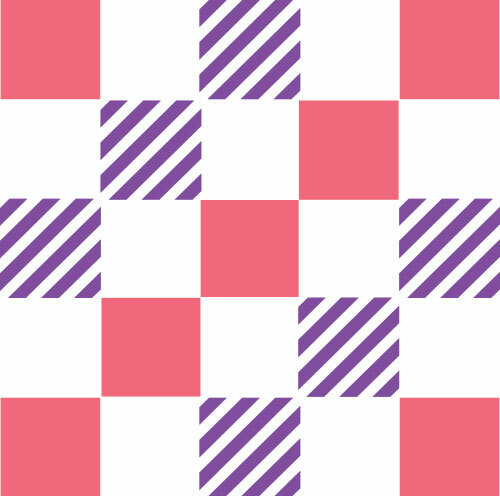 It doesn’t take more than a few quirky pattern ideas, an installation of Adobe Illustrator CS6 on your computer and a few minutes off your clock, to create umpteenth patterns with utmost ease and accuracy. 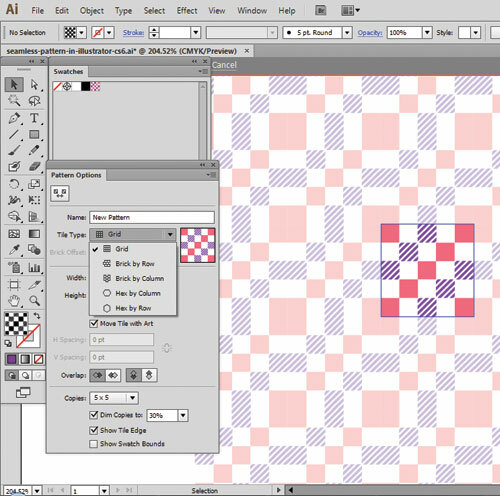 The new feature that the Pattern Creation in the update Adobe Illustrator boasts will certainly make your work a whole lot easier. So, it is highly recommended to ditch your old-school Adobe Illustrator CS5 or CS5.5, and instantly switch to this awesomely talented Illustrator CS6. I hope you have enjoyed it as much as I did while making this tut. Post Contributor: Kylie Clark is a 23-year old freelance writer, blogger and photographer. She writes articles on design and technology for several print magazines as well as technology blogs. She likes to experiment things with graphic design software and these days she is busy working on HTML5 Based Apps.